There are some movies you remember not liking, and then upon seeing them later, you discover you were wrong. Then, there are those which you see in your youth, remember fondly, and then see later and wonder what you were thinking. MISSION IMPOSSIBLE II falls into the latter category. The movie has Ethan Hunt trying to track down a deadly virus. 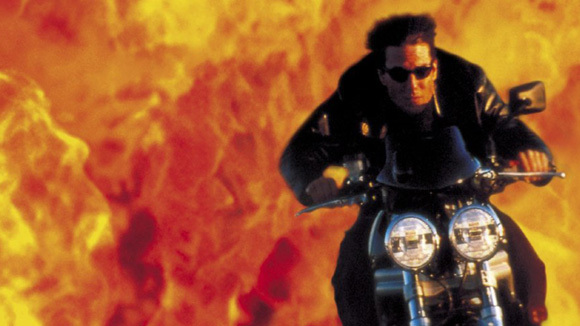 I watched MISSION IMPOSSIBLE II (2000) on 8.18.09. It was my third viewing of the film, but first since probably 2001. A few fun moments. We do get the patented John Woo dove flying by (several times in the climactic scene, for no good reason). But this movie does not have the rewatchability of the first one. I found myself more bored than stimulated. Sometimes knowing what is going to happen makes for a better second viewing, but not here. ~ by johnlink00 on August 18, 2009.